Planning a family vacation, as we all know, is not always a simple task and there are many factors to consider before we travel: destination, price, facilities, travellers’ opinion… When we choose where to go we usually consider the offer for kids that those places offer. Benidorm is a great family destination for families with children of all ages and adapted to all budgets. 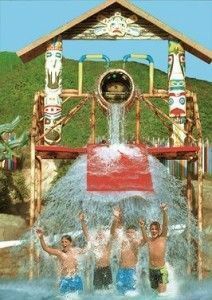 There are many theme and water parks where there are attractions and activities from babies to teenagers. There is also a circus suitable for all audiences, open throughout the year with acrobats and first level humourists. The beaches are sandy beaches and have meeting points to don’t get lost at any time. Furthermore, although the sea is always calm, the beaches are controlled by lifeguards throughout the day. So Benidorm beaches are brilliant for kids to play comfortable and safe. There are different scheduled activities during the year. On Visit Benidorm page, we find all this information. The weather is mild throughout the year, so visit Benidorm is a good option in any month. Tranquillity and security. Children can play in the spacious streets and public areas. As mentioned, Benidorm has an exceptional climate throughout the year. The best option is to enjoy it in an open space surrounded by nature! Meet people. People relate to each other more than in any other type of accommodation, you make friends and holidays become even more special. Personalized attention at the campsite reception. It is much appreciated especially if there is any mishap in the cabins or some information is needed. It offers some types of cheap accommodation. The value can be very good if we choose appropriately. Therefore, many people extend the stay and enjoy few days and nights together because of the good prices. A varied entertainment programme during their school holidays. Kids have super fun activities throughout the day: pool games, ping pong, billiards, drawing, treasure hunt and much more. Some of them such as aquagym are aimed at the whole family to spend time together. Two pools and a children’s pool to have a safe bath. A fully new game’s zone. In summer 2016 we opened our Pirate Boat next to the pool bar. The cleanliness of the campsite is highly appreciated by all our guests. Undoubtedly, it is a very important factor if we travel with kids. Kids free! In our plots, the first child is free in high season and babies are free throughout the year. Make family tourism economically without giving up anything is possible. Our shaded pitches are great for camping with family and friends, especially in summer. In addition, they are suitable for all types of caravans, campers or tents. Bungalows and cabins with capacity up to 9 people. Large families are delighted with the wooden houses of the campsite. In addition, all our bungalows have kitchen, bathroom and air conditioning. We offer free baby cots. If you pre-order them, they are installed directly on arrival in the bungalow. There is the option of hiring bed and breakfast or half board if you want to be completely relax. In case you prefer to cook, the campsite has a supermarket with all basic products. Free WiFi everywhere! Especially important for teenagers, all camping bungalows have their own router. Space to park the car next to the bungalow or in the same plot. Very convenient to load and unload the family stuff. A barbecue area with tables and benches where you can meet other campers. 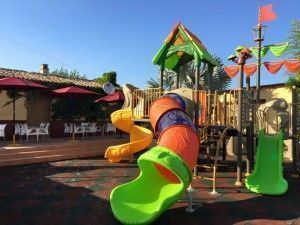 At the campsite reception, you can find discount tickets and family packs to Aqualandia, Terra Mitica, Mundomar, Terra Natura, Aqua Natura, Benidorm Circus, excursions and more. And it is very close to the centre of Benidorm! Enjoy whatever you like: From the quiet Camping Armanello to the vibrant life of Benidorm there are only 5 minutes. All ready to make the holidays with young kids and teenagers fantastic for everyone. See you soon family!